The dinner parties have started up again after a few week's recess. We had an awesome number of people and less than awesome amount of pasta at last Tuesday's meal and tonight we are planning for roast chicken, potatoes, bacon braised brussels sprouts, salad, asparagus and a lovely French yogurt cake to top things off. Although I would love to do some slow-roasted sticky chicken for our crew, there simply isn't time between 5 p.m. and 8 p.m. to get the thing cooked and on the table. So in the interest of expediency, we tried something a little new before prepping the chickens last night. With a little online instruction, we essentially butterflied our birds in a much less tidy and efficient way than this tutorial depicts. 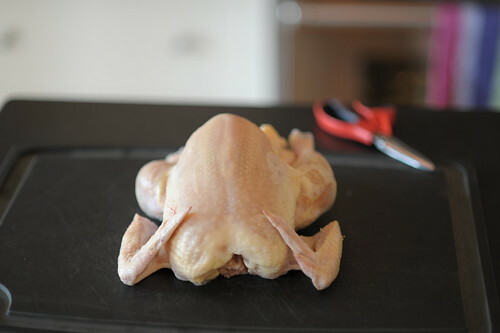 We went a step further cutting each chicken into two halves before rubbing them down with our typical sticky chicken mix and sticking them in the fridge to hang out for the night. Today I plan to roast them at a more moderate temp that my typically low 200 degrees - lets say 350-375 should do the trick. Might also finish under the broiler so we can get some crispy skin, because nothing is better than crispy skin. These pics are from a tutorial on CookThink- Also helpful is this YouTube video. Will let you know how it turns out!